Wrestling is predetermined. Some even call it fake. I myself have used that term, not really thinking. As a kid, I loved it. It lost some of its appeal to me as an adult, but lately it has had some nostalgic value. So, I was a prime target for Fighting with My Family, a true life sports tale that gives professional wrestling a Rocky type story to tell. Even if you couldn’t care less about wrestling, this is still entertaining and inspirational. The movie is funny, heartwarming, and will literally make you stand up and cheer. Usually that’s just a cliched critic’s quote, but here it’s just plain the truth. 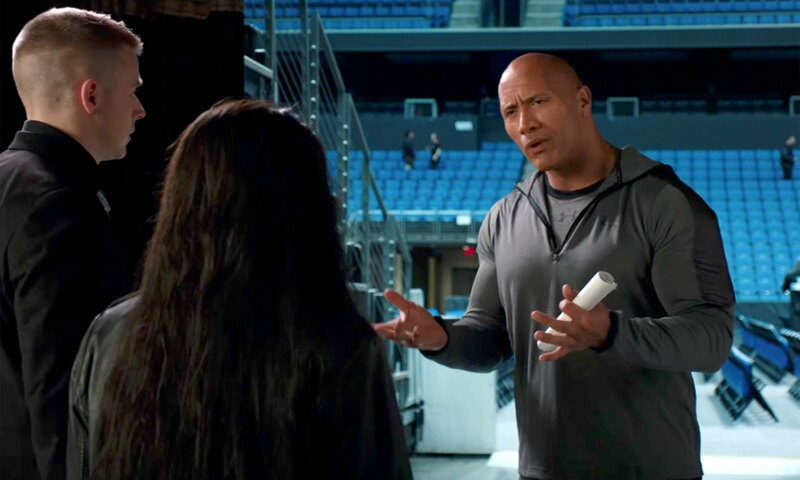 The film is a sports biopic about professional wrestler Saraya “Paige” Bevis (Florence Pugh), who shocked the world of sports entertainment when she defied the odds and became the youngest Women’s Champion in WWE history. When we first meet her, she’s just part of a wrestling family in a small English town. Her father Patrick “Rowdy Ricky Knight” Bevis (Nick Frost) and her mother Julia “Sweet Saraya” Bevis (Lena Headey) met through wrestling and now run an independent wrestling organization. Their crown jewel is Saraya’s brother Zak “Zodiac” Bevis (Jack Lowden), who dreams of a career with WWE. When the company notices them and invites both to a tryout, Saraya is the only one picked. As she goes off to train in America under the tutelage of Hutch Morgan (Vince Vaughn), Zak struggles to deal with his dream being over. Re-christened Paige, she begins working towards the goal of getting a WWE contract. It’s safe to say what ends up happening, but watching it unfold is truly terrific. Stephen Merchant writes, directs, and co-stars, with Vik Sharma providing the music, while Remi Adefarasin handles the cinematography. Supporting players include Dwayne Johnson, among many others. I adored this picture. It mixes comedy, drama, and inspirational sports movie beats into a package that’s nearly impossible to resist. Pugh is a revelation, investing you perfectly in her journey. She’s quietly fantastic here. Johnson mixes in being The Rock with himself to put forward a cameo that may actually be his best on screen work to date. Then, there’s the wrestling. The film leans in to its predetermined roots, but still manages to get your heart racing when the inevitable final match begins. The beats may not be original, but the execution is top notch. Whether you know her story or not, Paige and her quest compels you thoroughly. In a few ways, this flick resembles not only Rocky, but Warrior as well. The former shares its true life underdog roots, while the latter has a closer pull in terms of intensity and even occasionally with plot points. Mostly though, Fighting with My Family is its own beast, just comparable to those two because the quality is there as well. It won’t get cited for Oscar attention like those did, but even without love from the Academy, this is still one of the stronger works of 2019 so far. It follows a Hollywood outline from start to finish, but it does it better than you’d ever expect. This weekend, audiences will be in for a crowd pleasing treat when Fighting with My Family opens up. It is unabashedly mainstream entertainment, but that heartwarming spirit is part of what serves it well. Combine that with some tremendous humor, Johnson’s cameo as The Rock, Pugh’s star making turn, and the overall sense of earned emotion, what you get is a film that’s easy to fall in love with. This isn’t a movie likely to rewrite the rules of cinema, but it is one that will make you smile almost from start to finish. When real life is as insane as it is right now, what more can you ask for? Be sure to check out Fighting with My Family, in theaters everywhere this weekend!